Attorney Ready to Go Before Grand Jury, but Has Not Been Called; Hutcheson Summoned in the Airing of the Dictograph Controversy. [Investigation of Reports That Disorderly Houses Again Are in Operation Begun—Foreman’s Move Surprise. Dictograph Row Not Taken Up. A broad and exhaustive probe into vice conditions in Atlanta was the unexpected turn taken by the Fulton County Grand Jury when it convened Tuesday morning supposedly to take up the Felder-Beavers-Lanford dictograph controversy with the attending charges of corruption and bribery of police officials. Foreman Beck himself conducted the inquisition. Witnesses who gave testimony at the morning session were asked for evidence pertaining to the existence of vice only. That the Grand Jury will conduct a sweeping investigation of new red light districts which are reported to have sprung up, despite the persistent warfare against such resorts by Chief of Police Beavers, is almost certain. Mayor James G. Woodward, Colonel Thomas B. Felder and Carl Hutcheson, the lawyer who says he has a list of disorderly houses of holding forth by reason of police protection, were the men called to testify in the morning. The Mayor was questioned closely as to his knowledge of existing vice conditions. He is said to have informed the grand jurors that his information was only hearsay. However, he gave out what he had heard in full. The Mayor also pointed out the jurymen possibilities for the existence of such practices. The examination of Mr. Woodward continued for more than an hour. Colonel Felder was before the Grand Jury for ten minutes. The attorney was not subpoenaed to appear at the hearing, but presented himself voluntarily. He is said to have outlined his own position in reference to the bribery charges and also the wholesale charges of corruption which have been made against the police. In connection with the latter accusations, Mr. Felder declared to the investigating body that he would submit documentary evidence showing the existence of vice in Atlanta to prove his previous assertions. It is believed that Carl Hutcheson, the young attorney in Felder’s office, is counted upon to supply this evidence. Mr. Hutcheson was called before the Grand Jury shortly before noon. While he did not carry in with him the list of resorts said to be operating now in this city, which he has compiled, he declared that if this document were asked for by the jurymen he would hand it over to them. That the Grand Jury was in possession of sufficient information to indict the keepers and proprietors of at least 30 houses of disreputable character was the announcement made by Mr. Hutcheson when he emerged from the session chamber after he had been before the jurors for more than an hour. He said that he had furnished positive evidence that these resorts and houses of assignation existed and that the policemmen [sic] on the beats knew of their existence. “But did you give them positive information that Chief Beavers and Chief Lanford knew of their existence?” he was asked. Colonel Thomas B. Felder appeared before the Grand Jury Tuesday morning at 10 o’clock, prepared, he said, to substantiate every charge he had made against the police department and its heads, and promising to open the eyes of the city to a condition of affairs that was startling in the extreme. 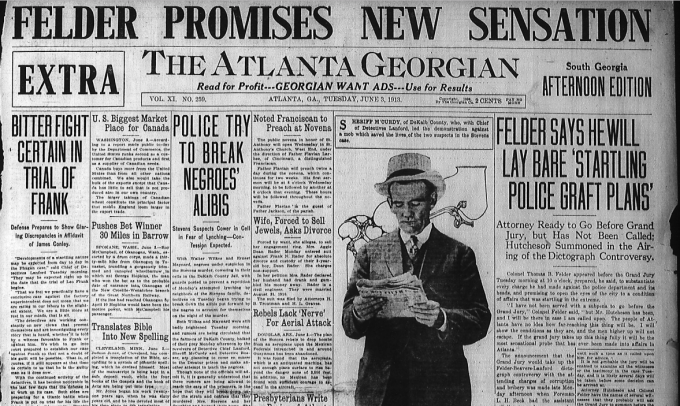 The announcement that the Grand Jury would take up the Felder-Beavers-Lanford dictograph controversy with the attending charges of corruption and bribery was made late Monday afternoon when Foreman L. H. Beck had the assistant solicitor general serve a number of subpenas to those concerned. Mayor Woodward, Chief of Police Beavers, Chief Lanford, Charlie Jones, proprietor of the Rex saloon; Carl Hutcheson, City Detective John Black and Mrs. Mina Formby were the persons summoned. The fact that Mrs. Fo[r]mby, a witness in the Phagan case, has been summoned, gave the meeting an air of mystery. It was stated on reliable information, however, that her testimony would have nothing to do with the Phagan case. It is understood that her name was one on the list that was to be furnished the police department by Carl Hutcheson, in which the attorney alleged she was receiving police protection. It was also said that the woman was not out of the city, as hinted a few days ago, but had merely changed her address and given the new location to the Solicitor. Whether the jury would take up charges of Chief Beavers and Chief Lanford that Attorney Felder offered a bribe of $1,000 to Lanford’s stenographer Febuary, or the counter charges on the part of Colonel Felder and Attorney Hutcheson, would not be discussed by the foreman. Chief Beavers, Chief Lanford and G. C. Febuary, Lanford’s secretary, were served Tuesday morning. Febuary’s subpena demanded that he bring the dictograph and documentary evidence he had taken in the affair. A. S. Colyar, Jr., had not been served, but Deputy Plennie Minor stated he would locate him during the morning. The dictograph stenographer, George Gentry, could not be located and it was reported he had left the city. Colonel Felder said he knew of the young man’s movements, however, and there was some probability of his being brought into the case in a new capacity. Foreman Beck would not discuss the Grand Jury meeting at all. He denied on several occasions that it was his intention to take up the matter until it was presented by the Solicitor. The Solicitor, however, knew absolutely nothing of the nature of the meeting until informed by his assistant late Monday afternoon. He said then that he did not know positively the Grand Jury would take the matter up, but intimated if it did it would conduct its own investigation until such a time as it called upon him for advice. It is not probable the jury will be enabled to examine all the witnesses or the testimony in the case Tuesday, and it is likely several days will be taken before some decision can be arrived at. Attorney Hutcheson and Colonel Felder have the names of several witnesses that they probably will ask the Grand Jury to summon before the investigation is concluded.